Her nickname is “Books,” if that gives you any indication of Dr. Meaghan’s favourite past-time! Yes, she’s can usually be found researching, reading, or writing up files at all hours of the day… and night! Riding her motorcycle or having her nose in a book and are always good bets as to what Dr. Meaghan is up to when not at the hospital. Always an animal lover, Dr. Meaghan’s dreams were answered when she was accepted to the Atlantic Veterinary College in 2014. 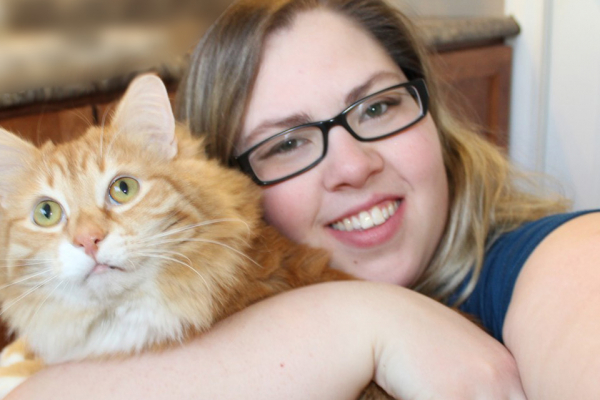 Upon graduation, she and her kitty, Bentley, made the move from Darmouth, Nova Scotia, to join the CBS Animal Hospital family…and she’s never looked back! That was in early 2018 yet it feels like she’s been a member of the pack forever. Although she misses her huge (we mean huge!) family in Nova Scotia, she’s loving every minute of exploring our beautiful province.